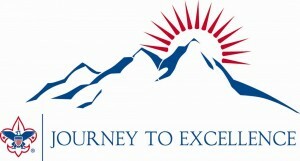 Journey to Excellence is the performance measurement and recognition program for packs, troops, teams, crews, and ships in the Boy Scouts of America. It provides a method for recognition, a framework for planning, and a source of guidance. JTE is a framework for planning for your unit and for your adult and youth leaders (if you are a troop, crew, team, or post) to use. JTE is a method for evaluating your unit. JTE provides an assessment of how you’re doing in the key areas found in great units. JTE helps provide guidance in areas where you might do better in conjunction with advice and counsel from your commissioner. JTE sets specific guidelines and standards of what the BSA considers good performance.